One of the major changes we’ve seen in the landscape of American law enforcement over the last decade is a major shift away from traditional appearance directives. It’s not uncommon to see uniformed police officers sporting visible tattoos, casual clothing, or even backwards baseball caps (subscribers: see the August issue of American Police Beat for photos). As police officers have adopted a more casual look, cities, counties, and bosses have pushed back with rules and regulations designed to give officers a more formal or professional look. 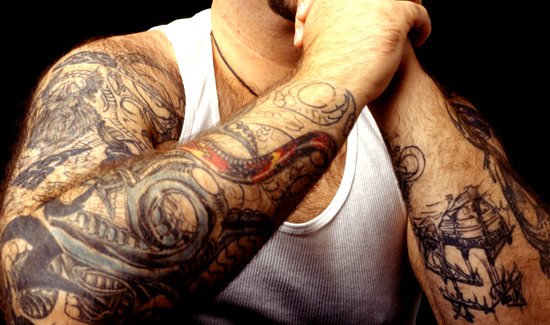 In Chicago, for instance, cops have been ordered by the brass to cover up their tattoos, whatever the content (i.e. images or words). Now the rank and file is fighting back through their union. The Fraternal Order of Police says the new rules about covering up tattoos on the job was never subject to negotiations at the bargaining table. Some of the complainants want to be able to display their St. Michael tattoos whether they’re on-duty or off. Visibility is, of course, the whole point of a tattoo, no? Cops say the department’s order to cover up tattoos, regardless of their content, is a violation of the officers’ First Amendment rights.